Purchase with the Armourdillo 76 key deluxe case and receive £20 discount! Delivering award-winning emulations of piano, organ vintage electronic instruments and more, the Nord Electro 6HP Performance Synthesizer builds on it's predecessors with new pipe models, dual organ mode, bigger polyphony, seamless transitions between voices and more. When you glance over the Nord Electro 6HP top panel, you will see that the clearly laid out organ, piano and sample synth give you all of the hardware controls you need reducing the need for deep menus so that you can have a more "hands-on" performance experience. Although these sections are separated for easy operation, you can of course layer and split the sounds as you see fit. The piano section gives you access to the huge onboard 1GB memory that is also compatible with the expanding Nord piano library so you no longer have to worry about trying to find that perfect piano sound, with the Nord Electro 6D it comes guaranteed. The organ section uses physical drawbar controls and now the Nord 6HP also features a new principal pipe organ model as well as classic C, V and B Hammond models, there is also a Farfisa model with vibrato. The final section is the Sample and synth section. With 256 MB dedicated to the Nord sample library, you have access to synth and ensemble sounds that can be used alone or layered and split with piano and organ sounds to make incredible timbres. All sounds can then be run through the built in incredible effects such as reverb, tremolo, rotary speaker, delays, chorus, flange and many more. The Nord Electro 6HP introduces a new seamless transition technology that means when you're shifting between voices and settings there will be no unwanted drop outs or big changes in volume so that you can play with confidence. This also applies when playing in split or dual modes. The Nord Electro 6HP has a built in set list mode that lets you group programs and settings together for instant recall on the stage. This allows you to quickly scroll through settings with clear direction from the built in LED screen making those quick changes during and in-between songs a breeze. You can even move song settings on the fly for those last-minute set list changes. 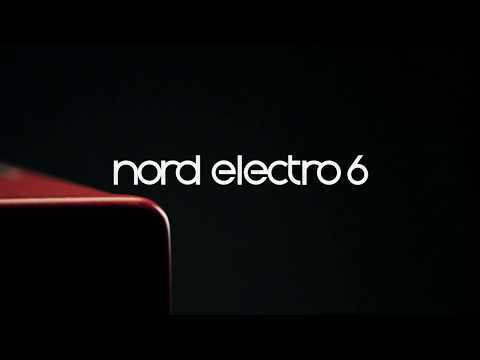 The Nord Electro 6HP is a powerhouse on the stage and in the studio. It contains a full complement of MIDI and USB connectivity so it can fit into any existing set-up with ease. There are also connections for line out, expression and sustain pedals for amazing control over your performance.